Our specialization enables us to come up with the wide range of Conical Flask for buyers all over the globe. Manufactured to perfection, our Conical Flasks are ideal for storing, mixing and dispensing different types of chemicals and liquids. In fact, for various applications in industries, we can make available Conical Flasks in standard as well as customized sizes. We are a trusted name as Conical Flask Manufacturer, Exporter and Supplier from Pondicherry, India. The tapered sides and narrow neck of this flask allow the contents of the flask to be mixed by swirling, without risk of spillage, making them suitable for titrations. Such features similarly make the flask suitable for boiling liquids. Hot vapors condense on the upper section of the Erlenmeyer flask, reducing solvent loss. Erlenmeyer flasks' narrow necks can also support filter funnels. 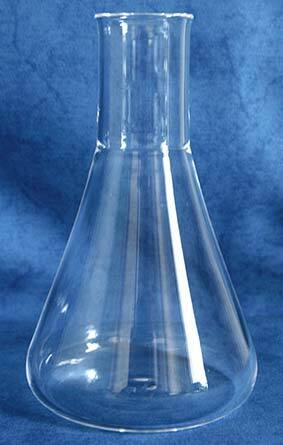 Erlenmeyer flasks are also used in microbiology for the preparation of microbial cultures. Plastic or glass Erlenmeyer flasks used in cell culture are sterilized and may feature vented closures to enhance gas exchange during incubation and shaking.